This post also appears on World Wide Pop, my latest project featuring pop & indie culture from all over the world. I’m posting this here because it reports on something from China. I first discovered I am MT (我叫MT, 2009-1010) while reading an article about the Tudou Video Festival Awards 2010. Tudou is one of China’s Youtube clones and its annual awards ceremony was once dubbed by a friend as China’s Sundance Festival. While this claim is probably not accurate, it does show that online video in China is a big deal. 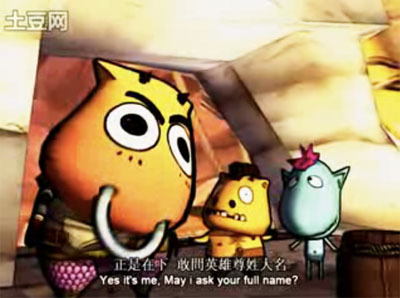 And within the 2010 Tudou awards, the team behind I am MT garnered the the most popular video blogger award. Currently airing its third season, I am MT is an animated online TV series that is set loosely in the universe of the World of Warcraft (a giant online game where lots of people play together to kill monsters, one another and then level up). Each episode is 24 minutes long and features various cute SD characters hanging out, fighting one another and questing within the game’s world. The plot has elements of both medieval fantasy and slapstick humor. Aside from slapstick, it also employs what people in China call e-gao humor. E-gao has been translated as “spoofing”; it’s a type of parody that borrows heavily from the original cultural work. In this case, I am MT makes fun of the World of Warcraft setting as well as borrowing theme songs and visual elements from Japanese pop culture. Unfortunately, I find the writing weak and the pacing erratic. But then again, as a non-World of Warcraft player, I’m not the target audience. See for yourself though, all episodes starting from season two have subtitles in both English and Chinese. Season 3 episode 1, which is my favorite of the four I sampled. Thanks for the info. A year and a half ago I came across MT and tried to find out something about it with no luck. In fact, I thought it might be Korean, because of the WOW references. Yours is the first article for me to find. MT does get into some personal online gaming themes that I thought touching. Such as, when people meet and become friends online, then one drops off, or can’t keep up the relationship due to whatever circumstances. Previous post China’s internet celebrities are fake! ?